9 I speak the truth in Christ—I am not lying, my conscience confirms it in the Holy Spirit— 2 I have great sorrow and unceasing anguish in my heart. 3 For I could wish that I myself were cursed and cut off from Christ for the sake of my brothers, those of my own race, 4 the people of Israel. Theirs is the adoption as sons; theirs the divine glory, the covenants, the receiving of the law, the temple worship and the promises. 5 Theirs are the patriarchs, and from them is traced the human ancestry of Christ, who is God over all, forever praised! Amen. Some people think we shouldn’t share the Gospel with Jewish people because they are covered under the Old Covenant with God. But consider what Paul is saying here and how it makes the point that Jewish people need Jesus, too. He was saying that he’d give up his salvation if he could so the rest of the Jews could be saved. The point is that he can’t do that, and that they need to come to Jesus on their own. 1. If someone as awful as Paul — whose former role was terrorizing Christians — can be redeemed, there is hope for us. 2. If an outstanding Jew like Paul still needed Jesus to be saved, then so does every other human on the planet. 16 It does not, therefore, depend on man’s desire or effort, but on God’s mercy. 17 For the Scripture says to Pharaoh: “I raised you up for this very purpose, that I might display my power in you and that my name might be proclaimed in all the earth.” 18 Therefore God has mercy on whom he wants to have mercy, and he hardens whom he wants to harden. People don’t like to hear those phrases, but God has ultimate control of the universe and what happens in the end. The Bible is crystal-clear that God knows who will come to him and who will not. Some people passionately debate whether God has already decided whom He will draw to him and others think it is due to our free choices (I’m probably over simplifying that, but I’m not trying to resolve it here). Both sides have compelling Bible passages to support their conclusions. It is an important topic but I think someone could hold either view and still be a Christian. 19 One of you will say to me: “Then why does God still blame us? For who resists his will?” 20 But who are you, O man, to talk back to God? 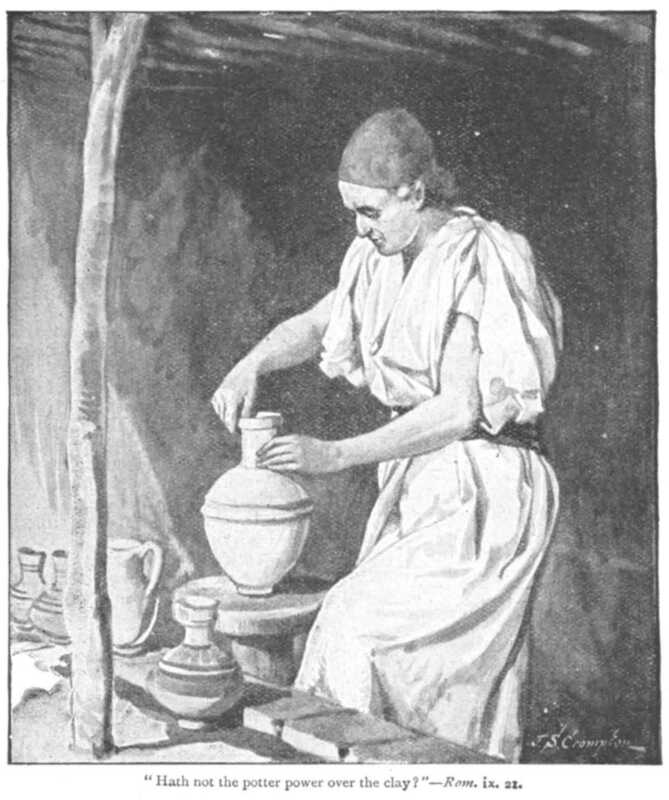 “Shall what is formed say to him who formed it, ‘Why did you make me like this?’” 21 Does not the potter have the right to make out of the same lump of clay some pottery for noble purposes and some for common use? Now there is an important and humbling phrase! God is the potter. We are the clay. Too often people want to reverse the roles and make God in their own image. When you think of things from God’s perspective that is a pretty ridiculous idea. Paul frequently quoted from the Old Testament. He reminds the Romans – and anyone else who will listen – that it was always God’s plan to save the Jews and the Gentiles (non-Jews) through the Jewish race. And He did that through Jesus. Once again, Paul points out that we are saved by faith, through God’s grace, and not by any righteous deeds or adherence to the law on our own. 7 Do you not know, brothers—for I am speaking to men who know the law—that the law has authority over a man only as long as he lives? 2 For example, by law a married woman is bound to her husband as long as he is alive, but if her husband dies, she is released from the law of marriage. 3 So then, if she marries another man while her husband is still alive, she is called an adulteress. But if her husband dies, she is released from that law and is not an adulteress, even though she marries another man. 4 So, my brothers, you also died to the law through the body of Christ, that you might belong to another, to him who was raised from the dead, in order that we might bear fruit to God. 5 For when we were controlled by the sinful nature, the sinful passions aroused by the law were at work in our bodies, so that we bore fruit for death. 6 But now, by dying to what once bound us, we have been released from the law so that we serve in the new way of the Spirit, and not in the old way of the written code. There is big difference between trying to win God’s approval by doing good things (a hopeless plan) and doing good things out of our love and thankfulness for him – not to mention our faith that what He says in his law is best for us. 7 What shall we say, then? Is the law sin? Certainly not! Indeed I would not have known what sin was except through the law. For I would not have known what coveting really was if the law had not said, “Do not covet.” 8 But sin, seizing the opportunity afforded by the commandment, produced in me every kind of covetous desire. For apart from law, sin is dead. 9 Once I was alive apart from law; but when the commandment came, sin sprang to life and I died. 10 I found that the very commandment that was intended to bring life actually brought death. 11 For sin, seizing the opportunity afforded by the commandment, deceived me, and through the commandment put me to death. 12 So then, the law is holy, and the commandment is holy, righteous and good. V. 8 captures part of the human condition. Ever since Genesis 3 our motto has been give us a rule and we’ll break it. Here we have the Apostle Paul – arguably the greatest evangelist ever and a stellar Jew by any definition – and he still did things he shouldn’t have and didn’t do things he should have. He needed a Savior just like we do, and he couldn’t be sinless on his own. Just because we are Christians doesn’t mean all sin and temptation is gone. In fact, you may face increased temptation. Satan loves to trip up believers to quiet us and impact our witness. Paul was really sounding negative and hopeless, but he was just building up to the solution: Jesus is there to rescue him! Some people think that salvation in Christ is a license to sin, but that completely misses the point. It buys into the myth that sin = fun, when that is not the case at all. Sin separates us from God and causes misery. Once we are saved through faith in Christ we will still sin, but that doesn’t wipe out our salvation. It does affect our relationship with God. One example I heard is that if your child spit in your face you would still love her, but your relationship wouldn’t be the same until that issue was dealt with. Also, with Christ we can have power over sin and temptation that we didn’t have before. The most unique thing about Christianity (other than Jesus, of course) is the concept of grace. All other religions and worldviews are basically systems of good works designed to have you win over God or man. Christianity says that is hopeless, but God in his infinite graciousness provides the solution for us. One of the interesting things about grace is that if you explain it properly then people are likely to misunderstand it – at least temporarily. Here’s what I mean: If you explain grace well then people are bound to ask if that means that we can sin on purpose. Of course, with a full understanding of grace people will realize that we wouldn’t want to sin. But I think it is actually a good sign for them to ask the question. It means they realize just how fantastic and broad God’s grace is. “We should no longer be slaves to sin” – Amen to that! Stop to meditate on that liberating truth. When God helps us take something away He doesn’t leave a void. It is replaced with something better – much better. We are free from sin, if we will just exercise that freedom. Now we can be slaves to righteousness. V. 23 is a classic verse for evangelism. It reminds us that the payment for sin is spiritual dead. We are all spiritually dead with a saving trust in Jesus. But God is so good and generous to us. He gives us a completely free gift of eternal life in Christ Jesus our Lord. Has your condition been upgraded to alive? 5 Therefore, since we have been justified through faith, we have peace with God through our Lord Jesus Christ, 2 through whom we have gained access by faith into this grace in which we now stand. Note that this says, “peace with God,” not the peace of God. We can have peace because of our relationship with God and our trust in his promises. But first we need peace with God. As James 4:4 says, friendship with the world is hatred towards God and makes us his enemy. So we need to go from being his enemy to being his friend, and we do that through Jesus. We are justified — made right with God in a judicial sense — at a point in time. It isn’t an ongoing process as some religions teach. He sanctifies us (makes us Holy and more Christ-like) over time. And we rejoice in the hope of the glory of God. 3 Not only so, but we also rejoice in our sufferings, because we know that suffering produces perseverance; 4 perseverance, character; and character, hope. 5 And hope does not disappoint us, because God has poured out his love into our hearts by the Holy Spirit, whom he has given us. Sometimes people “sell” Christianity based on the good things it offers. It does offer many great things in this life, but we shouldn’t overlook that Christians are also promised suffering in this world. Many people will think, “I didn’t sign up for this!” But God uses sufferings for his good and ours. It develops perseverance and character and leads us to hope. Meditate on v. 8 for a bit: Jesus didn’t have to die for us, but He demonstrated his love for us by doing so – even though we were sinners. He didn’t die for us because of anything noble we had done. Paul emphasizes how this all started: Adam (and Eve) sinned and humanity fell. We have been sinners ever since. Our only hope is for God to reach down and save us. Jesus’ perfect righteousness and sacrifice made an acceptable bridge for us to get back to God. That is a key Christian concept: We are saved by faith, because God credits it to us as righteousness. We can’t be good enough on our own because of our sinful natures. But God, in his mercy, forgives us when we put our trust in him. But that leaves us nothing to boast about, which actually is a good thing. Jesus did all the work. We don’t have to worry if we have “enough” faith – we just have to put our faith in what He did, not what we do. 7 “Blessed are they whose transgressions are forgiven, whose sins are covered. Yes, we are blessed, and should remember that every day! Consider the thousands and thousands of sins that God has removed from us if we trust in Jesus. All the things we did that we shouldn’t have done, the things we should have done but didn’t do, and all the evil thoughts. We were spiritually dead before God saved us. I love v. 20-21, especially where it says Abraham was “fully persuaded that God had power to do what he had promised.” God promises so many things to us (watch for the promises as you read the Bible). And we can be 100% confident that He’ll deliver on them all.